This document details the process that the Volpe National Transportation Systems Center (Volpe) used to develop vehicle travel forecasting models for the Federal Highway Administration (FHWA). The purpose of these models is to allow FHWA to forecast future changes in the use of passenger and freight vehicles (as measured by the number of vehicle-miles traveled, or VMT) that are likely to occur in response to predicted changes in future economic conditions and demographic trends. Forecasts of VMT developed using this model will inform and support the development of future transportation plans and policies by the Federal government and other transportation policy makers. The FHWA VMT forecasting models provide forecasts of VMT for the entire U.S., disaggregated into three vehicle type categories defined by FHWA: light-duty passenger vehicles, including automobiles and light-duty trucks (FHWA Vehicle Classes 2 and 3); single-unit trucks (FHWA Vehicle Classes 5, 6, and 7); and combination trucks (FHWA Vehicle Classes 8 through 13). The FHWA VMT forecasting model was developed using widely used and well-documented statistical and econometric techniques to estimate the influence of underlying economic and demographic factors on passenger and commercial vehicle use. Forecasts of these underlying demographic trends and economic factors are then used in conjunction with the model's individual equations to develop forecasts of future travel demand and VMT growth. The sections that follow describe the model development process, including the specification and econometric estimation of the equations that comprise the final set of VMT forecasting models. The first section discusses the economic theory of travel demand, which provided the basis for identifying and selecting appropriate economic and demographic variables—those likely to influence the demand for vehicle trips—for testing and inclusion in the forecasting models. The second section details the methodology employed in developing the forecasting equations and selecting the most reliable versions. It describes the statistical tests and criteria used to ensure that the selected equations combine historical explanatory power with accurate forecasting performance. Subsequent sections of the report provide details of the specific models themselves. These sections offer further insight into the key influences on VMT incorporated in each individual equation. Vehicle travel is often described as a derived demand, meaning that a trip taken in either a passenger or commercial vehicle is typically a means to transport passengers or freight from some initial location to a desired geographic destination. Generating predictions of how the amount of travel will change in the future thus requires an understanding of the factors that motivate passenger travel and freight shipping, as well as expectations about how these explanatory factors will change going forward. In the case of passenger VMT, economic theory suggests several factors likely to exert strong influences on households' ownership and use of motor vehicles. The primary determinants of personal motor vehicle travel are household demographics—including the total number of households as well as their size, composition, and geographic distribution—and their economic circumstances, particularly the employment status and income levels of their individual members. These factors collectively affect household members' participation in activities outside of the home – working, shopping, conducting personal business, recreation, etc. – which is the underlying source of their demand to travel. In turn, household members choose among non-motorized forms of travel (such as walking and cycling), public or school-provided transportation services, and travel in personal motor vehicles to satisfy their demands for travel. The primary determinant of truck travel is likely to be the overall level of business or economic activity, particularly in manufacturing industries (as distinct from service industries), since goods production and distribution involves extensive movement of both raw materials and finished goods. Because some specific categories of economic activity such as construction and international trade generate particularly large volumes of freight movement, the composition of overall economic activity can also be an important determinant of total truck use. The price of motor vehicle travel is also a major influence on the demand for travel. In the case of personal vehicles, the price of vehicle use includes the value of the driver's and any other occupants' travel time, mileage-related depreciation of the vehicle itself, the cost of fuel consumed, prices for other operating and maintenance inputs, and any charges levied for roadway use or parking at trip destinations or stop-over points. For freight-carrying trucks, the price of travel includes the driver's wage rate, use-related vehicle depreciation, fuel and other vehicle operating costs, vehicle maintenance, and the inventory value of the freight or cargo being carried. The geographic distributions of households, employment opportunities, production and warehousing facilities, and shopping and recreational destinations are also likely to influence the use of both passenger vehicles and freight trucks. 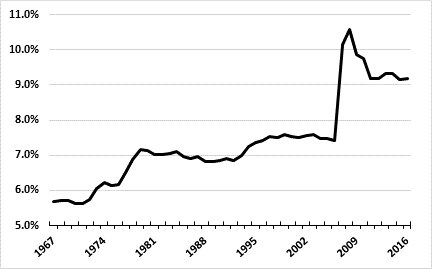 Recent research examining the economic and demographic influences on travel demand indicates that the contributions of these factors to total VMT growth have been changing over time.1 An example of this is growth in the number of licensed drivers, which has slowed as the fraction of the age-eligible population holding drivers' licenses approaches the saturation point (Figure 1). Growth in licensed drivers was once a key component of increasing passenger VMT: between 1950 and 1960, nearly half of the growth in passenger vehicle use was associated with an increase in the number of licensed drivers.2 By the 1980s, however, the contribution of increases in the number of licensed drivers to growth in vehicle travel diminished sharply as the fraction of those already licensed approached 100%, and the more recent decline in VMT has accompanied a decline in the fraction of the eligible population holding drivers' licenses. Over this same time period, factors such as personal income, labor force participation – particularly among women – and the costs of owning and operating personal vehicles also varied in ways that combined to produce variation in year-to-year growth in the use of personal vehicles. Historically, changes in the price of gasoline had a pronounced effect on the demand for vehicle travel. For example, the sharp oil price spikes of the mid-1970s, early 1980s and, more recently, the late 2000s, together with the accompanying economic recessions, exerted downward pressure on VMT growth, and the subsequent sharp drop in petroleum prices during the mid-1980s was partly responsible for the resumption of rapid growth in vehicle use. Other factors whose effect on VMT growth has varied widely over time include changes in the distribution and density of the U.S. population, along with major shifts in population between regions of the country, between urban and rural locations, and within many major metropolitan areas. Since the mid-1970s there has been a gradual downward trend in the rate of VMT growth, and year-to-year variation in travel growth rates has become less pronounced over time (Figure 2). Within this long-term trend, however, there have been shorter periods during which VMT grew strongly; this was particularly evident during the mid-1980s, when the U.S. economy's emergence from recession combined with the sharp decline in petroleum prices from their early-decade highs to produce a surge in VMT growth. 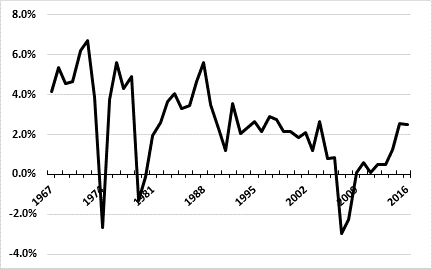 The 1990s, a period of sustained economic growth and low oil prices, also showed short periods of strong VMT growth. The sharp increase in gasoline prices beginning in 2008 combined with the subsequent deep recession and other developments to produce a prolonged period of declining vehicle use.3 The steady improvement in economic activity through the mid-2010s, however, has seen a resumption of growth in vehicle travel demand. This highlights the important relationship between general economic conditions and vehicle use. Although this discussion has focused primarily on passenger vehicle travel, developing approaches to modeling truck VMT is also important. While truck use represented less than 10% of total VMT in 2016 (Figure 3), freight traffic is a critical component of the nation's transportation activity. Truck use is also an important consideration for infrastructure investment policy, since trucks are responsible for a large portion of highway wear and tear, and may also contribute disproportionately to congestion and road safety conditions. Additionally, trucks play an important role in the national economy; in 2012, trucks moved 71% and 73% of all commercial freight, as measured by weight and value, respectively.4 The growth in the international trade in goods has also relied largely upon trucks to move imports and exports between U.S. coastal ports and inland distribution centers. Because of the importance of freight transportation, careful consideration was given to distinguishing the factors likely to influence truck travel from those more likely to affect the use of passenger vehicles. In particular, since the demand for truck use is largely derived from raw materials shipments to supply manufacturing facilities and the distribution of finished goods, particular attention was paid to including various measures of manufacturing activity, and goods production and delivery. These include the fraction of total economic activity accounted for by goods production, the volume of international trade, and the value of mail-order and internet sales, which substitute increased truck use for home delivery for shoppers' travel to and from retail stores. A major challenge in developing VMT forecasting models arises when comparing and selecting the best specification from among multiple alternative possibilities (ranging into the hundreds). To meet this challenge, this effort employed a comprehensive and systematic approach to model development, evaluation, and selection. The first step in the model development process was identifying the factors likely to influence vehicle use. Guided by the economic theory of travel demand, these factors were selected separately for each vehicle category: light-duty vehicles, single-unit trucks and combination trucks. Within each broad category of underlying influences on vehicle use, alternative measures of that influence were identified for potential inclusion in varying model formulations; for example, household income levels could alternatively be measured by total or per capita GDP, total or per capita disposable personal income, median household income, and other measures. Table 1 summarizes the broad categories of explanatory variables and the alternative measures that were used to represent each category. Historical data on vehicle use, demographic factors, and economic variables were drawn from a range of sources, most of which are publicly available. These include FHWA (notably, its annual Highway Statistics publication), the Energy Information Administration, R.L. Polk, the U.S. Bureau of the Census, and the U.S. Department of Labor. The historical range over which the national-level models are estimated spans 51 continuous years for light-duty vehicles, and 47 years for trucks; these data series begin in 1966 and 1970, respectively. An important category of variables that was explored includes data describing land use patterns; that is, measures that capture the geographic distributions of population and employment—particularly, their density within and dispersion around central cities, and their distribution between urban and suburban regions of metropolitan areas. At the nationwide level, however, no suitable measure of the influence of land use on motor vehicle travel could be identified. Candidate measures either did not display sufficient variation over time to identify their influence on vehicle use, or were inadequately or inconsistently defined at the national level throughout the historical period used to develop the models. The economic and demographic variables selected as candidates for testing were then entered into a model specification matrix that included different possible combinations of the variables used to measure each category of influence. Within this matrix, alternative model specifications were carefully designed to test and compare how effectively each variable captured the underlying influences it was intended to measure, both individually and in conjunction with other important determinants of VMT. This allowed examination of the stability and robustness of each individual variable in its relationship to vehicle use, particularly when combined with other explanatory influences, and also enabled easy tracking of the many specifications that were tested. At the national level, approximately 300 different model specifications were examined for each vehicle class as part of this process. Percent of Population Aged 20-65 Yrs. Percent of Families with Children < 18 Yrs. The primary aim of this model-building procedure was to develop a model that forecasts accurately—in other words, to minimize total forecasting error. The error in the forecasts produced using a given model can be separated into two components. First, future values of the model's explanatory (or input) variables are unknown and must themselves be forecast; "input error" refers to the component of error in the model's forecast that can be attributed to imperfect predictions of its input variables. Minimizing such input error will tend to favor the development of parsimonious models: the smaller the number of input variables a model includes, the lower the combined uncertainty of the predictions of these variables. "Specification error," on the other hand, is the component of error inherent in the design and calibration of a particular model. This error reflects how well the variables it includes (and the relationships expressed by their estimated coefficients) capture the "true" determinants of the dependent variable. If a model is poorly designed— for example, if it excludes important variables, includes variables that do not belong, or its functional form causes it to understate or exaggerate the contributions of certain explanatory variables— the forecasts it produces will exhibit high specification error, even when they are generated with perfect foresight about the model's input variables. Minimizing specification error would generally lead the model developer to include more, rather than fewer, explanatory variables, so as not to omit any important influences from the model. Thus, attempts to reduce each type of error will frequently entail conflicting recommendations for the model-building procedure. The emphasis during the testing process was placed on models exhibiting the lowest level of specification error. In isolating the magnitude of specification error from that of input error, the mean average percentage error (MAPE) statistic is a particularly useful tool. The relative extent of the two error components for a given model can be examined by comparing the MAPEs calculated from out-of-sample and in-sample forecasting tests. Specifically, the accuracy of a model's in-sample "forecasts," which are constructed using the actual historical values of its explanatory variables, provides a measure of its specification error. Specification error was also examined by using the models to generate out-of-sample forecasts, which are constructed using the known values of the explanatory variables to forecast VMT for part of the historical period over which the full model was calibrated. The model's accuracy can then be examined by comparing its forecasts of vehicle use against their actual values for this part of the period.6 The final model selection process aimed to ensure high forecasting accuracy, while also insuring the structural integrity of the model by including all theoretically influential and significant factors. During the model development process, particular attention was paid to issues that commonly arise due to the time series nature of economic data. One particular concern is the presence of autocorrelation in the residuals of an econometric equation, which occurs when the unexplained residual or error terms in successive time periods are correlated. Another concern is the potential existence of strong underlying time trends or unit roots in the individual variables used to estimate model parameters, and the potential for accompanying cointegration between the model's dependent variable and its explanatory variables. In the presence of unit roots and cointegration, relying on standard statistical estimation and diagnostic methods may lead to the development of models that appear reliable, but embody spurious associations rather than stable behavioral relationships. If autocorrelation is present, regression coefficients will be inefficiently estimated (although their estimates remain unbiased), normal significance tests are not valid, and the performance of the forecast from the equation is not as robust as it could be. Autocorrelation can occur if the model's specification does not accurately reproduce year-to-year fluctuations in the value of its dependent variable over time, or conversely, if the model predicts more year-to-year variation in its dependent variable than has actually occurred over history. The presence, or absence, of a unit root is one way to characterize the underlying temporal structure of a data series. The absence of a unit root essentially means that the data series lacks a trend, and instead varies around a stable mean; such a variable is referred to as stationary. Its average may be positive, negative, or zero–as long as it remains approximately constant. Conversely, the presence of a unit root implies that the variable is non-stationary–its mean is either rising or declining consistently over time, thereby producing a historical trend in its value. The existence of unit roots is often discussed in terms of whether the series is "integrated"; a series is integrated of order one when the first difference of the variable is stationary, or the difference between its values in successive time periods is roughly constant. Many of the economic variables included in the models have unit roots (or are integrated of order one); in practical terms, these series typically show a steady upward trend over time.8 A similar pattern can be seen in the dependent variable (vehicle use, as measured by VMT) as well. In the presence of unit roots, the standard errors estimated via the models may be inaccurate, leading to improper inference about the significance of the model coefficients. More importantly, estimated relationships that fit the data well and appear to reflect causal association may in fact be spurious if their variables have unit roots. During the model development process, every variable was first tested for the presence of a unit root. Extensive testing was then conducted to identify the existence of cointegration between pairs of variables displaying unit roots, focusing particularly on cointegration between the VMT measures to be used as dependent variables in the models and the candidate explanatory variables listed previously in Table 1.12 These tests indicated the presence of unit roots in some variables, as well as some degree of cointegration among the variables included in many of the proposed model specifications. Accordingly, alternative econometric estimation procedures were tested for their effectiveness in using cointegrating relationships to improve these specifications and develop models that produced more reliable forecasts. These alternative approaches included estimating single-equation error correction models (ECM), autoregressive distributed lag models (ARDL), multi-equation vector autoregression (VAR) and vector error correction models (VECM). Of these various time series modeling approaches, the ARDL models proved superior in terms of robustly modeling the cointegrating relationship between VMT and the set of macroeconomic variables used to explain its historical growth. Forecasts of the input variables come from three sources: IHS Markit (IHS), the U.S. Energy Information Administration (EIA), and the Volpe Center. IHS provides the majority of the variables used for forecasting national VMT. The Volpe Center developed independent forecasts of road supply and truck fuel efficiency. Volpe's initial forecasts employed growth rates of light-duty fuel efficiency that were developed for NHTSA as part of its analysis of future Corporate Average Fuel Economy (CAFE) standards; subsequently, information from EIA has also been incorporated to project future changes in fleet fuel efficiency. Both IHS and EIA provide scenario-based forecasts (i.e., a baseline and high and low growth outlooks). The Volpe-produced forecasts are not constructed around the same scenarios, but can be modified to produce alternative future outlooks. Each model includes one or more measures of the level and composition of the specific components of economic activity that are likely to affect demand for personal travel or freight shipping. For example, truck usage is influenced by the fraction of GDP accounted for by specific economic sectors such as manufacturing, construction, and international trade. Similarly, light-duty vehicle use is partly a product of real personal disposable income, since this variable influences household members' opportunities to participate in activities that require travel away from home. Household characteristics such as average size, number of children, age distribution of members, metropolitan location, and distribution by geographic region were also expected to affect the volume of light-duty vehicle travel, but their effects generally proved difficult to identify at a national level. Each model also includes a measure of fuel cost per mile driven, which is equal to fuel price per gallon divided by average fuel economy in miles per gallon for the relevant vehicle class. This variable is intended to capture the fuel-related cost of driving, which is typically the largest component of the total variable cost of operating each type of vehicle. Although there are several alternative measures of fuel-related costs, fuel price divided by fuel efficiency was preferred because it accurately reflects the independent influences of both variables on vehicle operating costs.19 The effects of vehicle purchase prices and ownership costs on aggregate vehicle use were also tested in the VMT forecasting models for each vehicle class, but the influence of these variables on vehicle use was difficult to detect. Measures of aggregate highway mileage or average highway miles per registered vehicle were also tested in the national-level VMT forecasting models for single-unit and combination trucks. These variables were intended to capture the effect of road capacity and the intensity with which it is utilized on travel speeds, which in turn are expected to influence demand for personal travel and freight shipping, but their influence on VMT could not be detected reliably. Measures of the supply and prices of competing travel modes – public transit service levels and fares, as well as rail shipping rates – were also tested for their influence on aggregate light-duty vehicle and truck use, but no such effects could be detected. Finally, to facilitate interpretation, all model variables have been transformed into natural logarithms, which means the resulting coefficients can be interpreted as elasticities of vehicle use with respect to each model's explanatory variables. As Table 3 shows, the national light-duty vehicle forecasting model includes short- and long-run variables for personal disposable income per capita, average fuel cost per mile, and a short-run measure of consumer confidence in the economic outlook. Personal disposable income per capita enters the equation in linear form and with a squared term; the estimated coefficient on the linear term is positive, while that on the quadratic term is negative. This implies that personal disposable income per capita has a positive impact on VMT (that is, as household income levels rise, vehicle use per person increases), but that the magnitude of this effect declines as income continues to increase. Notes: Suffixes on the variable names indicate the values of a variable from the previous year (-1) period two years previous (-2). Critical values for the bounds test are taken from Pesaran et al. (2001) for case 3. Model lag lengths were based on best BIC statistic. Fuel cost per mile appears with a negative coefficient, indicating that as the cost of driving increases, households choose to travel less. As expected, higher consumer confidence in the future of the economy is associated with an increase in the number of vehicle-miles driven per person. The light-duty VMT forecasting equation also includes the previous period's value of the dependent variable as the adjustment variable in the error correction form of the ARDL. The adjustment variable has the correct negative value and is statistically significant, implying that aggregate light-duty vehicle use adjusts gradually to changes in disposable income, fuel costs, and consumer confidence. Specifically, the magnitude of its estimated coefficient suggests that the effects of changes in these factors on VMT are only partly felt in the year when they occur, and require five years to be felt completely.21 This presumably reflects the existence of structural inertia in households' decisions affecting travel demand and vehicle use, such as where their residences or workplaces are located and the number of vehicles they own. The bounds F- and t-statistics both confirm the presence of this long-run cointegration relationship between VMT and the macroeconomic variables. The Cumby-Huizinga test result indicates no significant presence of serial correlation in the regression errors, ensuring that the bounds test is unbiased. In addition, the small in-sample and out-of-sample MAPEs provide a good indication of the relative forecasting accuracy of the model. Table 4 presents the national aggregate forecasting model for combination truck VMT, which includes long-run variables of net exports of real goods and fuel cost per mile. In addition, an indicator variable is included to capture the structural break in the data generating process for CT VMT for the periods 2007 and 2008. The model was estimated with the inclusion of the time series data before 1980 (1970-1979) in the final specification. Therefore, to correctly model for the period prior to 1980 an indicator variable and interactions with the explanatory variables are needed to capture the tightly regulated CT market during this time. As expected, the coefficient on net exports is positive, implying that growth in the trading sector of the U.S. economy increases demand for the longer-distance shipping services typically provided using combination trucks. Fuel cost per mile appears with a negative sign, again as expected, which suggests that declining retail fuel prices or improvements in combination-truck fuel economy will also increase shipping activity using combination trucks. Notes: Regulation indicator is equal to 1 prior to 1980, and 0 from 1980-2016. The bounds test critical values are taken from Pesaran et al. (2001) for case 3. Model lag lengths were based on best BIC statistic. The adjustment variable is highly significant with the correct negative sign, implying moderate inertia in the CT carrier industry. The estimated adjustment back to the long-run equilibrium trend is roughly 2.7 years. In addition, the bounds F- and T-statistics provide clear evidence of cointegration between CT VMT and the explanatory macroeconomic variables. The Cumby-Huizinga test also provides evidence against serially correlated errors, validating the significant cointegration results from the bounds tests. Finally, the in- and out-of-sample MAPEs suggest good accuracy from a forecasting perspective given the shorter time series used to estimate the parameters. National single-unit truck VMT is modeled as a function of the long-run value of fuel cost per mile, together with both short- and long-run measures of the consumption of other nondurable goods. Also included in the model is an indictor variable that captures the structural changes in the VMT series made by FHWA starting in 2007.22 Table 5 shows the model results, with both short- and long-run effects of consumption of other nondurable goods having the expected positive sign. The fuel cost per mile variable is negative and significant. The structural break indicator is strongly significant since it captures the large, sudden increase in the VMT data resulting from the change in the data generating process. Notes: The bounds test critical values are taken from Pesaran et al. (2001) for case 3. Model lag lengths were based on best BIC statistic. Similar to the combination truck model, the adjustment variable is highly significant, and its magnitude implies a long-run adjustment period of about 3 years. The estimated bounds F- and T-statistics provided further evidence that the long-run cointegrating relationship exists between single-unit truck VMT and the two independent variables. The test for autocorrelation also shows no evidence or concern for autocorrelation. Finally, the in- and out-of-sample MAPEs are within reasonable ranges, and suggest that the model for single-unit truck VMT is well specified and has reliable forecasting capabilities. FHWA and the Volpe Center update the parameters of these VMT forecasting models as additional data on vehicle use, demographic factors, and economic variables become available each year. In addition, the agencies will periodically re-examine the appropriateness of the specification and estimation procedure used for each model, in order to identify opportunities to better explain historical variation in vehicle use and improve its forecasting performance. Whenever significant changes in model parameter values, functional forms, or statistical estimation procedures used for any of the VMT forecasting models are adopted, FHWA will issue an updated version of this report describing those changes. In the meantime, FHWA will employ the models described in this report to develop and issue revised forecasts of national VMT by light-duty vehicles, single-unit trucks, and combination trucks each year, as updated forecasts of each model's explanatory variables are issued by IHS and developed by the Volpe Center. These forecasts, together with a brief description of the underlying economic outlook on which they rely, are available at: https://www.fhwa.dot.gov/policyinformation/tables/vmt/vmt_forecast_sum.cfm. 1 For example, see David A. Hensher, Nariida C. Smith, and Frank W. Milthorpe, "The Demand for Vehicle Use in the Urban Household Sector, Theory and Empirical Evidence," Journal of Transport Economics and Policy (1990); Don H. Pickrell, "Description of VMT Forecasting Procedure for "Car Talk" Baseline Forecasts," Volpe Center, U.S. Department of Transportation (1995); and Steven E. Polzin, "The Case for Moderate Growth in Vehicle Miles of Travel, A Critical Juncture in U.S. Travel Behavior Trends," Center for Urban Transportation Research, University of South Florida, report to U.S. Department of Transportation (2006). 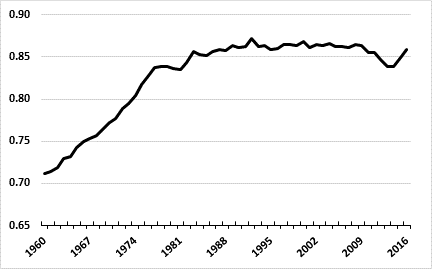 2 More specifically, if the annual VMT per licensed driver had remained at its 1950 level, growth in the number of licensed drivers would have resulted in half of the growth in total annual VMT that actually occurred between 1950 and 1960. 3 According to the National Bureau of Economic Research the recession started in December 2007 and ended in June 2009. Total non-farm employment in the U.S. did not return to its prerecession peak until May 2014. 5 The sharp spike in truck VMT in 2007 is due to a change in the way FHWA reported VMT. This change was accounted for during the forecast model development process. 6 As an illustration, the most promising alternative model specifications were re-estimated over a period ending in 2005, and then used in conjunction with the actual values of their explanatory variables to produce VMT "forecasts" for 2006-15. The forecasting accuracy of the models in this test – particularly their ability to predict the downturn in total VMT beginning in 2007 and its sustained sluggishness – is a particularly useful gauge of their likely future forecasting performance. 8 Similarly, a variable is integrated of higher orders when the variable must be differenced more than once to produce a stationary series. Nonetheless, series that are integrated of more than order one are uncommon in econometric analysis. 9Technically, two non-stationary variables are cointegrated if there exists a linear combination of the variables that is stationary. For example, if two series x and y are integrated of order one, but a third variable z can be created as some linear combination of x and y (say, the difference between x and y) and has no unit root itself, then x and y are cointegrated. 10 Engle, Robert F., Granger, Clive W. J. (1987) "Co-integration and error correction: Representation, estimation and testing", Econometrica, 55(2), 251-276. 11 The usual procedure for doing this is to use the residual terms from estimated cointegrating relationships, which provide a measure of the extent to which the values of two cointegrated variables during a specific time period diverge from their common underlying trends, as additional explanatory variables in a model relating changes in the same two variables to each other. Because cointegrating relationships in theory capture useful information about long-term equilibrium relationships between variables, exploiting these relationships in constructing models is often preferable to simply differencing the individual series and using their differenced values to estimate the relationship between their period-to-period changes. 12 The augmented Dickey-Fuller test was used to check for the presence of unit roots in individual variables. The Engle-Granger test was relied on to detect cointegration between individual pairs of variables, while the more complex Johansen test was used to analyze the presence of multiple cointegrating relationships. 13 Pesaran, M.H. and Y. Shin (1999). An Autoregressive Distributed Lag Modelling Approach to Cointegration Analysis. In: Strom, S. (Ed. ): Econometrics and Economic Theory in the 20th Century: The Ragnar Frisch Centennial Symposium. Cambridge, UK: Cambridge University Press. 14 These data are from the IHS April 2018 U.S. Macro long-term forecast. Real 2009 dollars are used to measure GDP, consumer spending goods, and gasoline prices. 15 See NHTSA, Environmental Impact Statement for the Joint Rulemaking to Establish CAFE and GHG Emissions Standards, MY 2012-2016 (2010). Available from http://www.nhtsa.gov/fuel-economy. 16 Moving forward, EIA's forecasts of fleet fuel economy will be used, as they span the total time period covered by FHWA's forecasts of VMT growth. 17 Current versions of the forecast models do not include road supply variables. 18 Forecasting bus VMT is difficult due to the fact that buses serve several distinct markets, each with different influences on demand: urban public transit, intercity coach travel, charter and commuter service, and school travel. As a result, a bus VMT forecasting model is not part of FHWA VMT forecast model. 19 This specification implies that the effects of variation in fuel prices and average fuel economy on the demand for vehicle use are equal in magnitude but opposite in direction. While some research suggests that fuel prices and fuel efficiency may have different effects on vehicle use, when these variables were entered separately the estimated magnitudes of their effects did not differ significantly from each other for any of the vehicle classes. 20 The negative signs on the lagged short-term coefficients for personal disposable income reflect the short-run adjustments to the mean trend value of LD VMT resulting from exogenous changes to income during previous periods. 21 The adjustment coefficient of -0.2 equates to an approximate 5 year adjustment back to a long-run equilibrium trend. 22 This indicator variable is expanded an additional year (2009) to capture any residual autocorrelation from the structural break in the VMT series.